When your home or business becomes a victim of disaster, time is of the essence. When it is your home or business on the line, you don’t have the benefit of waiting for help—you need it right away. We understand that a fast response is critical, which is why a rapid response to any size disaster is more than just a slogan for us. Water damage can occur through various ways such as flooding, appliance and/or plumbing failures, storm damage and fire damage, as water is used to put out the fires. In only a matter of mere minutes, water can spread throughout your property, saturating everything (i.e., walls, floors, upholstery and your belongings) in its path. Water damage left unchecked for over a week leads to significantly increased costs and restoration time and can also impact structural safety. We will provide an immediate response to any size disaster, which can help minimize the damage and keep cleaning and restoration costs manageable. SERVPRO of Fayetteville is locally owned and operated so we are close by when you need us and ready to respond whenever the call comes in. Remember, if you need us, we’ll be there—no matter the time or day. The team of highly trained restoration experts at SERVPRO of Fayetteville is available for emergency cleanup and restoration services 24 hours a day, seven days a week. Did you know that according to the latest research, as many as 50% of businesses never reopen after being affected by a disaster? As a business owner, there is nothing worse than having your business stop due to a disaster situation. Fire, water and storm damage often come without warning. 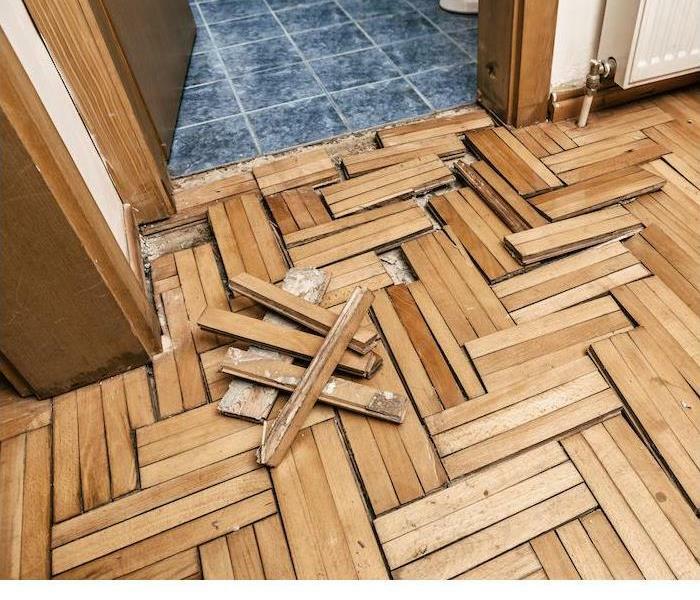 Fortunately, you can be prepared with the SERVPRO Ready Plan. Call us, SERVPRO of Fayetteville and we can help you create an Emergency READY Profile (ERP), which can help minimize business interruptions by having a clear plan of action laid out before disaster strikes. With an ERP, you’re able to provide us with specific details about your property prior to a disaster, which can help speed up the response time. Being prepared ahead of time saves you time and money and can mean the difference between reopening quickly or closing completely. 6. Facility details, like where shut-off valve locations are, what priority areas and priority contact information. We believe that pre-planning for potential issues can help you be ready for whatever happens. As a business owner, there will be many safety issues to consider regarding risks to your business, staff and visitors. You should spend a little extra time planning for and working toward reducing the risk of a fire. There are several steps you can take to protect your business which include focusing on fire risk assessment, fire prevention and staff education. First, you should look around your facility to assess the fire hazard risks. In some areas, the local government may provide a visit from a fire marshal who will help identify these risks and provide guidance on your fire prevention plan. Last, but definitely not least, make provision for your employees’ safety. Make sure that everyone knows what to do in case of fire by creating a fire plan and reviewing it with your staff. 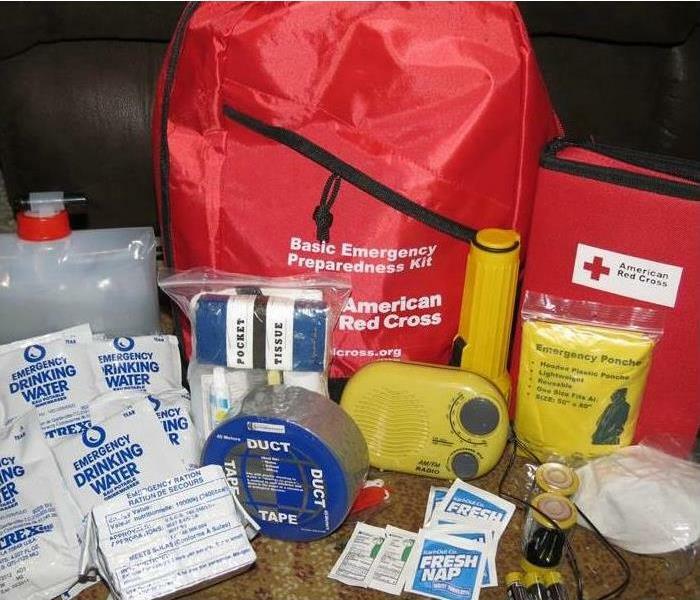 Conduct fire drills at least once a year to keep the fire safety protocol fresh, and take time to review evacuation plans and where the first-aid kits are located. Despite best efforts with fire prevention, the worst could always happen at your business. 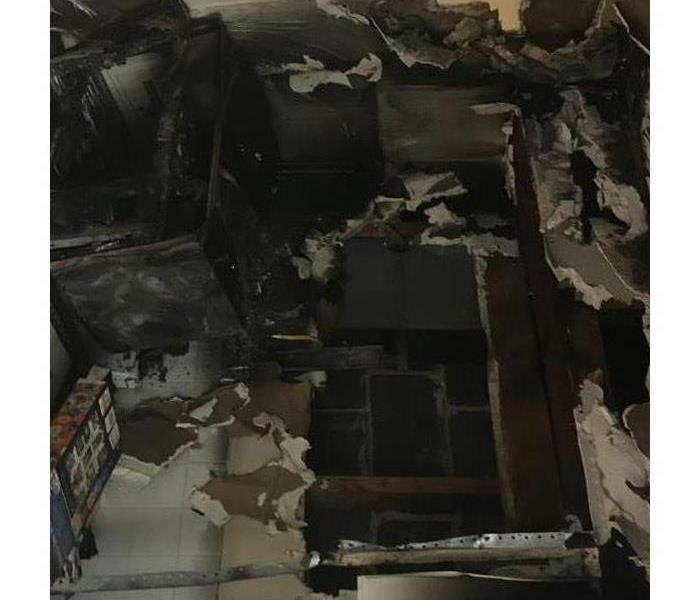 If a fire has damaged your business, SERVPRO of Fayetteville is available to help make it "Like it never even happened." Have you heard of the term "Black Water"? In the restoration industry there are three categories of water and as industry professionals it is our job to determine which category of water each damage has. The most severe category is Category 3 which is also commonly called CAT 3, Black Water or Dirty Water. Category 3 water (Black Water) is highly contaminated water that is potentially toxic to anyone inside the dwelling. 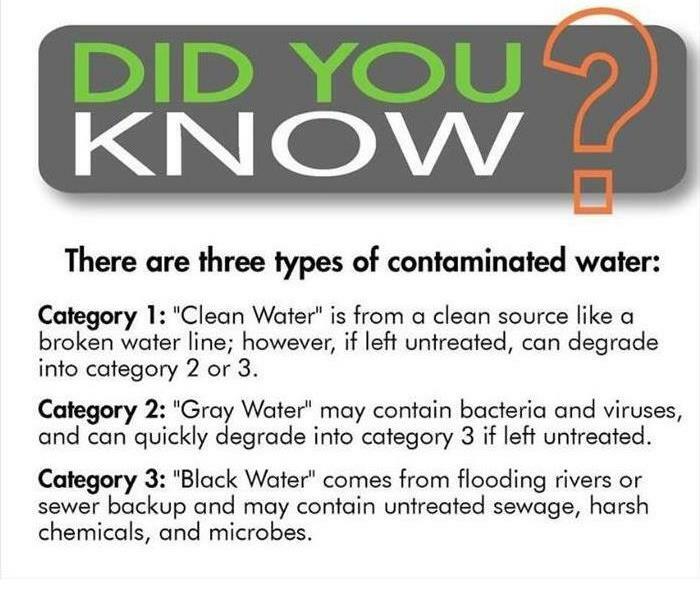 The water is considered category 3 (Black Water) if it meets any of the following criteria. Sources include sewage backup, flooding from rivers or streams, toilet overflow with feces or stagnant liquid that has begun to support bacterial growth. If Category 1 or Category 2 has been left untreated for more than three days, it is likely that it will develop into Category 3 (Black Water). If your damage is deemed as Category 3 (Black Water), it is likely that many pieces of your property will need to be replaced. Anything porous, such as furniture, carpeting and drywall is grossly contaminated. Category 3 water, although referred to as Black Water or Dirty Water is not always visually black or dirty. In fact, most times it is completely translucent. If you are ever faced with damage to your home or business you must act fast, find your source and call the professionals at SERVPRO of Fayetteville. We will assess the damage and ensure that it is properly mitigated to ensure your safety. Mold can spread quickly and can be difficult to detect. You can help prevent mold growth by reducing the levels of humidity in your home, fixing leaks in a timely manner, and ventilating areas of the home that are regularly exposed to moisture, like the bathroom and laundry room. However, after mold has invaded your home, it’s time for professionals like SERVPRO of Fayetteville to step in and lend you a hand. Mold can have varying degrees of health effects on the people exposed to it and can sometimes be non perceptible to those who are unaffected. However, for people with sensitivities to mold, exposure to it can result in congestion, wheezing, and throat discomfort. Those with mold allergies can have even more intense reactions. 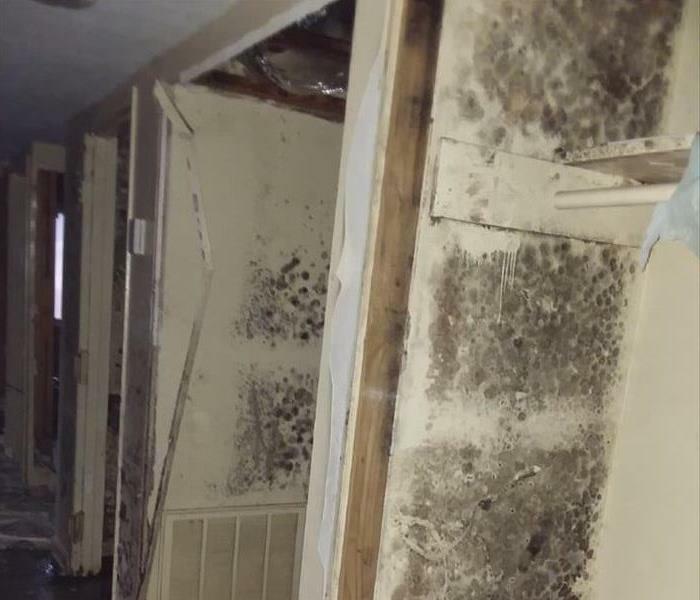 Because of the potentially hazardous nature of mold, especially with direct contamination, you should leave mold clean up to SERVPRO of Fayetteville. SERVPRO is here to help you by identifying mold in your home, remedying it with caution and expertise, and further preventing its spread. Tackling mold alone without the assistance of trained professionals can be dangerous. SERVPRO of Fayetteville offers 24-hour emergency service, specialized equipment, and highly trained mold remediation technicians. Locally owned and operated, SERVPRO of Fayetteville is a restoration company you can trust. For service help to Fayetteville, Hope Mills, and surrounding areas call SERVPRO of Fayetteville at (910) 860-1163. Colder seasons bring freezing temperatures, snow, sleet, and ice, especially to homes and commercial properties in areas prone to severe winters. SERVPRO of Fayetteville can provide immediate service in repairing and restoring your residence following storm damage. Keep your pipes from freezing by wrapping your pipes in insulation. You can also keep your pipes warm by opening cabinet doors to expose them to the heat flowing in the rest of the house and keep your water flowing by turning your faucets on to a slow, steady drip. You can secure the outside of your house by turning off the water hose, clearing your gutters of water buildup, caulking cracks in doors and windows, and trimming trees that can potentially cause damage to your home during windy conditions. Check the roof of your house for problems before a storm strikes. Large, flat roofs are susceptible to ice build-up and snow drifts. Roofs with weak insulation or structural weaknesses can lead to leaks and extensive water damage. SERVPRO’s quick 24-hour service ensures fast response to any size disaster. With reliable equipment, trained professionals, and a national network of franchises, SERVPRO of Fayetteville is the best choice when it comes to storm damage restoration. For service help to Fayetteville, Hope Mills, and surrounding areas contact SERVPRO of Fayetteville at (910) 860-1163. For service call SERVPRO of Fayetteville Fayetteville at (910) 860-1163. Fire damage to office buildings, motels, restaurants, and other small businesses can not only result in devastating physical property damage but the loss of company time and productivity. SERVPRO of Fayetteville is committed to helping you restore your business to it's prime conditions. However, it can be valuable for you and your business to know how to prevent commercial fire damage before it begins. Appliances: Appliances such as furnaces, boilers heaters, and stoves can cause fires if they are not properly installed and checked regularly for maintenance issues. Smaller appliances like electrical equipment and circuitry can also cause fire damage if they are not operating as they should be or they are mishandled. Human error: Some commercial fires are simply causes by human error and forgetfulness. Ensure that all employees know to turn off appliances such as space heaters and switch off microwaves and hotplates in the kitchen or break room. Something as small as a cigarette left un-extinguished can also lead to building fires. Arson: According to Fireline, arson is one of the most common causes of fires in commercial buildings. Arson is planned and malicious intent to create a fire, whether by a malcontent employee, fired individual, or mentally unstable citizen. Security cameras, fire alarm systems, and keeping an eye out for suspicious behaviors can help prevent arson. If you do seek restoration after a fire, SERVPRO of Fayetteville can provide assistance following commercial fire damage. Locally owned and operated, SERVPRO excels in fire damage as well as the water damage that accompanies firefighting efforts. A 24-hour emergency service company, SERVPRO offers top of the line technicians, special equipment, and personalized care. For service contact SERVPRO of Fayetteville at (910) 860-1163. Did you know that mold is present almost everywhere, indoors and outdoors. If your home or business has a mold problem, SERVPRO can inspect and assess your property and use our specialized training, equipment, and expertise to remediate your mold infestation. Natural disasters like hurricanes, flash floods, and severe storms can result in water damage through flooding. Pipes and drains can cause water damage if cracks, bursts, and clogs occur. Moisture, bulging, and rusting are all signs that pipes may need to be replaced. Build up of water on the roof can put strain on your house and lead to leakages. Clogs in your gutters from leaves and branches can cause blockages and prevent water from being diverted the way it should. Appliances like air conditioners and washing machines are also prone to leaks. Regularly check any equipment that uses water to ensure that it is working properly. SERVPRO of Fayetteville is a locally owned and operated restoration company that restores mold, water, and fire damage. A trusted leader in the water restoration industry, SERVPRO offers 24-hour emergency service and specializes in water inspection, water extraction, and drying services. If you face water damage in your home, you can count on SERVPRO to improve and mend any contamination and deterioration in your residence. Contact the experts at SERVPRO of Fayetteville (910) 860-1163. 3/27/2019 - Why Does Response Times Matter? 3/1/2019 - Do you have a mold problem in your home?